In the final evening of the 2017-2018 Nautical Nights Speaker Series, documentary filmmaker Tobi Elliott will introduce the story of the 120-year old vessel Dorothy, and her life and rich history sailing the West Coast. Tobi will present excerpts from the upcoming documentary “Between Wood and Water”, and cover some of the milestones from Dorothy’s “lucky” life on this coast: surviving both World Wars, witnessing the first documented sighting of the ‘Cadborosaurus’, the founding of the Victoria Yacht Club, a near-extinction from fire and being shown at Expo ’86. Doors open at 6:30pm, talk starts at 7:00pm. Drinks and appies are available. Please note, seating is limited. An incredible amount of early correspondence has been saved from the late-1890s when Dorothy was designed, built and sailed. In fact, it’s doubtful there is another boat on the west coast with such intense documentation! We will look at some early letters rarely seen by the public, and uncover some salacious correspondence between Dorothy’s first owner, W.H. Langley and the boat’s designer, Linton Hope, which give a glimpse into what life was like in the trades in England in 1897! W.H. Langley was prominent member of the British Colony of Victoria. In 1896, the barrister and Clerk of the Legislature decided he wanted a fast boat to race his contemporaries in the newly formed Victoria Yacht Club. His small Class 2 yawl “Viola” just wasn’t winning races, and so he commissioned a build from a European style design by Linton Hope, which happened to be named “Dorothy”. And Tobi will be sharing a few excerpts from Mrs. Langley’s diaries, which have never before been open to the public. The traditional Mrs. Langley wrote faithfully every single day in diaries that go back to 1914! The beauty of her very ordinary, everyday notes is that they provide an accompanying storyline to the very male-dominated accounts of Langley’s logs. It’s been a month since boat show season ended in the Pacific Northwest. Some of you are hopefully still on the water, while others are buttoning down for the winter. So let’s think of kinder, warmer things, like boat shows! 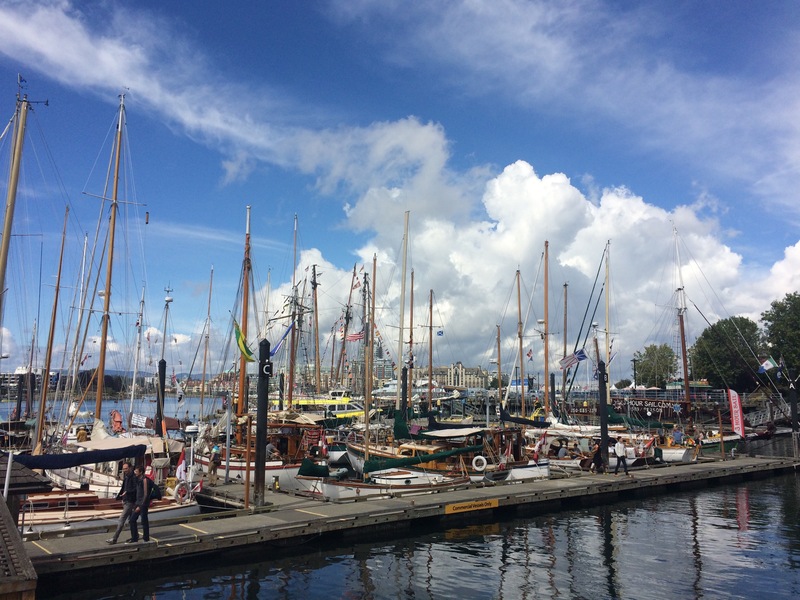 We had a fantastic time at this year’s Victoria Classic Boat Festival, the 40th annual. While nothing could make up for the absence of John West, a key founder and integral, energetic part of the festival over its four decades, the sun shone bright on the docks full of beautiful boats and interested visitors. It was the first year the Maritime Museum of B.C. took the helm and led the organization and programming, and they did an admirable job running the show. Congratulations! DOROTHY was on hand in spirit, if not in physical form. As it was her 120th anniversary, we celebrated with cake in the hall of the MMBC, and a hearty Happy Birthday. To make sure she was present “on the docks”, we hosted a table Saturday and Sunday with promotional materials, photographs and new 2018 calendars and anniversary T-shirts for sale. I was delighted that former owner Angus Matthews was able to join me on Sunday to chat with people on the docks. It was interesting to hear the response when we asked people whether they had heard of “Canada’s oldest sailboat”. Most said, no, but were intrigued. Then we’d ask where they were from and roughly half the time, they were from Victoria! I realized there are two distinct groups in this small but passionate boat community: those who have been following the Dorothy adventure closely, and those who don’t know anything about her story at all. I feel we have a lot of work to do in getting the Dorothy story out there. If you want to help with our mission of keeping her memory alive while the committee continues to raise funds for the rest of the restoration, you can help! We still have 2018 Anniversary Calendars for sale, with images ranging from the MMBC archives, her sailing in the 1920s-40s and 1980s, contemporary photos in Tony Grove’s shop, and even an exclusive shot of her from the Langley family that has never before been released to the public. Or, get our NEW T-shirt (Maroon and Heather Grey) with her anniversary dates 1897-2017. Send one to your friends, family members, or enemies, and tell them the story of DOROTHY. Or get an art card for Christmas mailouts, we have 6 different beautiful art cards. Email me at dorothysails@gmail.com for prices and orders. Christmas is just around the corner! After costs, proceeds are split between the restoration fund and the documentary, Between Wood and Water. For our Victoria boat show round up, the best thing from my perspective was the raft of forestry boats and workboats, most from British Columbia but a few from down south. I love their stories. I was intrigued to find out that restored B.C. forestry boats outnumber U.S. boats about three to one. 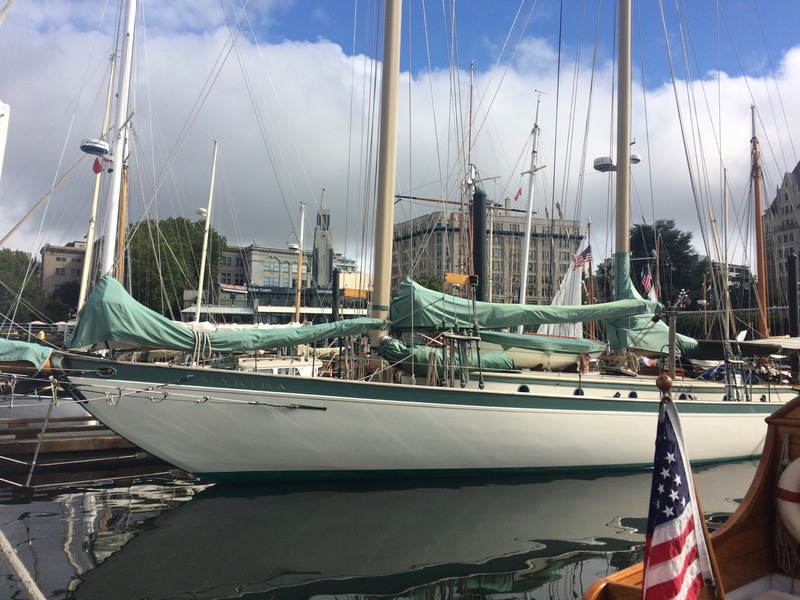 One notable exception is the 90-year old TEAL (image up top) which has a rich history patrolling the Alaskan coast and is now docked at Friday Harbor, WA. She won Best Conversion. It seemed like there were less sailboats than usual – perhaps because ORIOLE and MARTHA were missing (and perhaps it’s my biased eyes that want to see sailboats everywhere!) – but there were an amazing representation of all kinds of classic boats to grace the docks. Best Overall Sailboat: PACIFIC GRACE. The second best thing about the festival was hanging out with our friends Eric and Steve from OFFCENTERHARBOR.com. They were doing double duty as boat oglers and storytellers, getting some juicy bits on their favourite boats in the PNW. We love OCH videos, and if you haven’t checked them out yet, you should definitely subscribe because they feature not only the hottest boats, but the best stories on people making and restoring them. Look for them to feature PACIFIC, MESSENGER III and STITCH – all workboats of some kind – in the coming weeks. So that’s it for our boat show season – how was yours? Did you participate? Drop us a line or write a comment if you have a story to tell. Because after all, next to an insane desire to drop 1000s of dollars on our beloved vessels, the stories we get to tell about them is the next best reason to own them, right? If you have friends, neighbours or family members that don’t know about Canada’s oldest functioning, Canadian-made sailboat, consider giving them a Dorothy-related gift this year and helping us spread the word. Thank you Friends! And happy sailing! We (as in, Tobi Elliott in her ’67 classic red Volkswagen bug, and Tony Grove and Dorothy-in-spirit) are on our way down to Victoria from Gabriola to celebrate the 40th annual CLASSIC BOAT FESTIVAL!!! Can you tell I’m a wee bit excited??! I have a host of beautiful new swag to share, among them a special anniversary t-shirt, and a 2018 Calendar because, as you know, the grand dame of classic boats, our own Dorothy, is 120 years old! The calendar includes some photos that have never been seen before, including this image held by the Langley family (above). I am so happy to be able to share this precious legacy of 120 years of (almost) continuous sailing on the BC Coast! In 2014, Kate Bradford and I had the opportunity to shoot on the docks of the Classic Boat Festival, and since only a fraction of that footage will be used in the upcoming film about Dorothy’s restoration, I decided to put together a special anniversary video featuring some of my favourite shots from the docks and the water. I’ll be posting to that page and to Instagram (follow Dorothysails1897 and tag me #dorothyatfest) as well throughout the Festival, so if you can’t physically make it down, you can participate vicariously and enjoy the sights and sounds along with me. We made it! It’s that time of year again, and we couldn’t be happier. 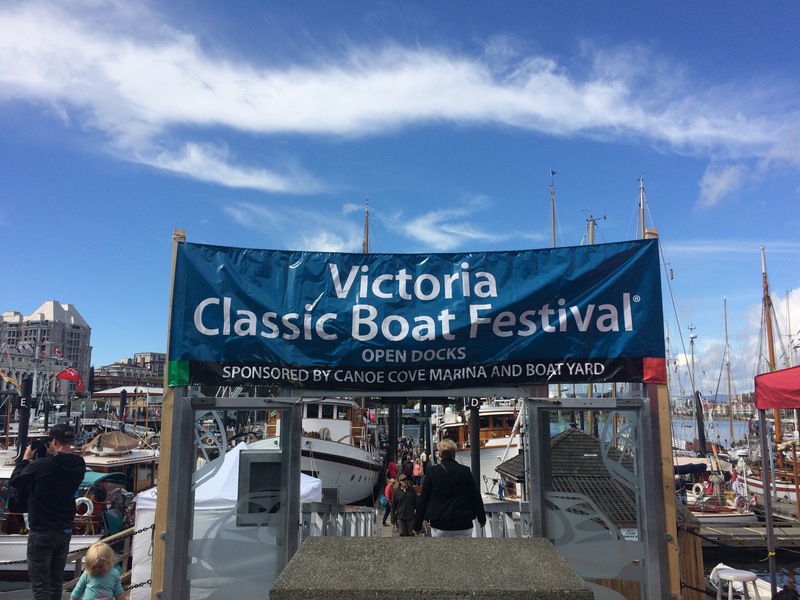 And after a pounding rain all night, the weather saw fit to cooperate with some glorious sun in time for the opening of the 39th Classic Boat Festival in Victoria. It’s such an honour to be here and to be mingling with people who are passionate about boats and, in many cases, have done so much to preserve and promote their own gorgeous vessels. I know from documenting Dorothy’s story that keeping a classic boat alive – especially a wooden boat – often calls for a sacrifice of time, energy and resources that people can only give if they’re in it for the love of their vessel. I’ll be here all weekend with materials and T-shirts promoting the documentary and Dorothy‘s restoration status. Tony Grove is judging boats in the festival, and everyone else is just enjoying walking the docks in the sunshine. Happy Labour Day weekend, everyone! Ps I had to sneak in a shot of my second all-time favourite boat, Martha. She is looking just (sigh) as gorgeous as ever. I am holding on to hope that one day soon she and Dorothy will sail side by side. As meticulous Langley was in preparing his boat for the water, he was still obsessed with sailing, and was racing his first yacht, Viola. Viola wasn’t fast enough for Langley though – he wanted a winning yacht. So he bought a design from Linton Hope, himself a successful Olympic yachtsman and the owner of the Thames Yacht Company in England. Langley intended to name his next racing yacht “Viola II”, but when he acquired the plans from Hope, they were named “Dorothy”, so he stuck with that. Evidently, she was fast. The stories of her successful races and regattas up and down the Northwest coast, I’ll save for another post. Below is a picture from Dorothy‘s 100th birthday celebration, in 1997. You may remember that our last post over a year ago lamented the tragic situation of the Maritime Museum of British Columbia. News broke in the community that the government had condemned the historic building that the Museum had occupied for 49 years, and they were forced to find a new home. The hope was that they could get a lease for the CPR Steamship Terminal building, unoccupied and in a central, waterfront location, but it was not to be. It was devastating for many of the countless volunteers, maritime experts and lovers of historical research to see practically all of the collections packed up and stored away. The unknown loomed: where would they be housed? How could they organize and store such a huge collection? Would anything be available to the public again? Was maritime history doomed to be relegated to a back alley storefront, a shelf in a library? Thankfully, the history of an entire province’s coastline is bigger than any single location, and, true to form, maritime history seems to have survived. Incredible as it seems, the forced move seems to have breathed new life into the organization, which had long struggled with the aging building and other issues. A new board, staff, website and vision have been birthed from the ashes, and in May 2016, they opened the doors to the Society’s modest location in Nootka Court, with a selection of the collection’s very best on display, featuring an interactive journey into the Franklin Discovery, the Captains Cook and Vancouver Journals, as well as many original works by marine artist John Horton featuring the “HMS Discovery”. Check out their featured exhibits here: http://mmbc.bc.ca/exhibits/featured-exhibits-2 We salute you in your new start! Dorothy‘s fate has always been tied to the people who care for her. She has survived longer than any other yacht in Canadian history because she was loved, appreciated and restored again and again. And now it appears that those at the Museum who have so enthusiastically revived the institution itself are embracing the chance to influence Dorothy‘s future as well. Tony Grove (who is charged with Dorothy‘s restoration for the MMBC) and I have been talking with new leaders and shapers at the MMBC, and we are extremely heartened by their avid interest and desire to make this little yacht’s story central to the province’s maritime future. There will huge news forthcoming as talks deepen and as we prepare for Dorothy’s 120th anniversary next year! Look for another significant update in one month’s time. There is so much to look forward to, and we thank you for joining us on this exciting journey. “Nine months of negotiation between Shared Services BC and the Greater Victoria Harbour Authority (GVHA) to secure a lease for the Maritime Museum of BC in Victoria’s old steamship terminal are at an impasse. As a result, Shared Services BC has informed both the museum and the GVHA today that it is not able to provide any ongoing financial support or fund capital improvements at the steamship terminal. The ministry has also asked the museum to vacate 28 Bastion Square by Sept. 30, 2015, to avoid risk to staff and to assess the state of the building, which is in disrepair.” Read the full release here. The end of more than nine months of negotiations “essentially scuppers all of our additional fundraising efforts based around obtaining a successful long-term lease,” said museum board chairman Clay Evans. But, instead of investment and support, what they got was delays and dodging. Finally, after negotiations “reached an impasse” in bureaucrat-speak, we heard that the province had no such intentions of support or investment. Hear the response from the province’s minister of Technology, Innovation and Citizens’ Services CBC On the island interview with Amrick Virk. The government claims it was simply asking too much to supply the $1 million to refurbish the new space. Like Willis, this is more than a passing concern for me. The provincial government’s failure to support a viable, prominent location for the more than 10,000 artifacts of maritime heritage on this coast makes me very angry. At present, the massive collection is being catalogued and moved for storage in another government-owned archival facility. (Note the use of the word “storage”, not “display”.) This move means more than the loss of a public storefront for visitors. It also means wasting hundreds of thousands of taxpayer dollars because dismantling this museum and rehousing it in a much smaller facility is akin to taking apart a boat or a complicated engine: it takes no time to take apart, but about 1,000 times longer to put it back together again. Also, there is the loss of community and shared knowledge: without a common location that gathers together the archival materials, research libraries, physical artifacts AND a display place for visitors to come learn about our history, you risk losing the dozens of volunteers who currently come to contribute their shared knowledge that makes up a rich body of cultural understanding. Without a place to come to, to research, to cross-link stories and artifacts, you will lose not only the past, but the present remembered collection, as well. And third, we are losing focus and vision as a province. If the MMBC is forced to come up with its own funds to get a small storefront space, with the majority of its collection “out of sight, out of mind”, what does that say about the priorities of this province? Does B.C. even recognize that we are a maritime province, built by boats and waterways, and that this maritime heritage is a valuable economic and cultural resource that should be invested in, rather than hidden away? Personally, I’m appalled at how this entire process has devolved. I’m even more discouraged than ever at our government’s lack of foresight, vision, and its misguided priorities. And professionally, as a documentary filmmaker, I’m going to keep a close eye on whether this government will continue to shutter our province’s maritime and cultural assets, rather than promoting them to the world, and what that means for the future of our Dorothy.